Would be an idea to be able not only to export bookmarks, but to SHARE them (like current position or route)? Sometimes suggestions stay behind reality! SORRY! If I share a Kurviger bookmark by WhatsApp, on my both Smartphones this bookmark is shown as an OpenStreetMap URL. Tapping on that URL in the post let me choose (again on both devices) Locus, what3words and Chrome - but not Kurviger! 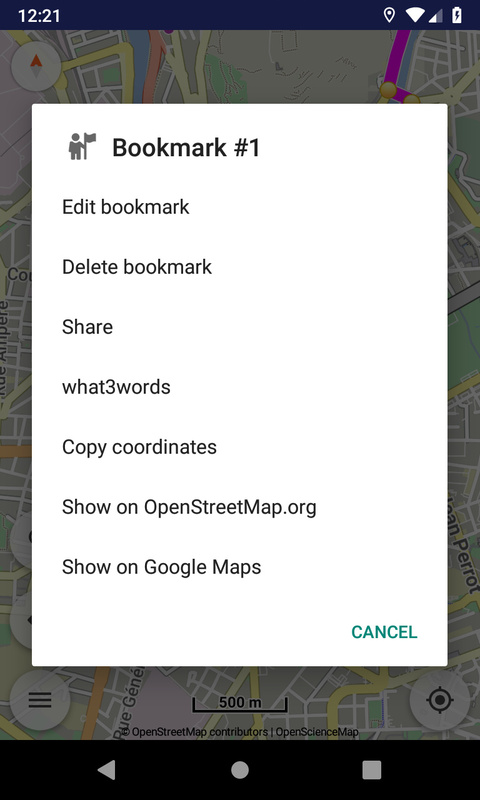 If I choose what3 words, what3words is opened and the position of the bookmark is shown on the what3words map, and a tap on the navigation button let me again decide between several navigation apps, THIS time including Kurviger. Opening Kurviger now shows the destination concurring wth the original Kurviger bookmark - and I can make the destiniation position to a new bookmark on the second device. So a real SHARING of the bookmark from Kurviger to Kurviger works in my case only via what3words. Or one has to export the bookmark to a file and the share the whole file via a messenger or another way. Both works (if familiar with it and in first case what3words running), but not such an optimal solution for a group of users, who just want to share Kurviger bookmarks. Is there any other idea to ease the sharing of Kurviger bookmarks? Testing with simple email, clicking on an OpenStreetMap link triggers also Kurviger among the apps to parse the OSM url. Actually may need to remove the “bookmark” suffix from the other entries! Since the dialog involves a bookmark, all options are expected to be for it. Interesting: With email and SMS it works indeed like this - but not with WhatsApp. Yes, I know - makes it much more complicated to describe procedures crossing apps in Docu. Tagged this topic as implemented - because, as I learned , it IS an implemented featuire (independantly from wording in menu) - ok?